Joseph C. Malloy was born February 2, 1899 in Sioux City to Joseph James Malloy (Sioux City fireman) and Charlotte “Lottie” Sheeley Malloy. The Malloy’s also had two daughters, Gladys & Lucille. Joseph began working for Armour & Co. when he was about fifteen years old and continued to work there his entire career. He was a master mechanic and retired from the Kansas City plant in about 1961 or 62. At his retirement, he oversaw all the mechanical and refrigeration for the plant. Through the years he, his wife, Elsie, and three daughters, Jeane, Marianne and Joan, Barbara’s mother, lived in Chicago, Sioux City, Mason City and Oklahoma City. Joseph died on December 21, 1974 in his Kansas City home. There were nine grandchildren. Elmer H. Titus was born on April 5th 1891 at Midnight in Hancock County, Iowa. My youngest brother was 11 when he died! Yes, my dad was a busy man, he was 58 when I was born and I couldn’t have asked for a better dad. Elmer left Iowa in 1920, to homestead in Wisconsin with his first wife, Sylvia Collison. He built one of the first propeller driven snowmobiles. He owned the Midway Garage in Tomahawk, Wisconsin. He was a hunting and fishing guide, deputy sheriff for ten years, deputy game warden and deputy fire warden for the Cassian Township. He aided the F.B.I. when they tried to capture John Dillinger at “Little Bohemia.” He leased a gold mining down in New Mexico. Elmer left Wisconsin to participate in the early beginnings of the oil industry in Venezuela. There he met, Ana Allen Perez, his second wife. I am a child of that marriage. He attended Palmer Chiropractic College in Davenport, Iowa. He had six kids and always told us stories about his horses during his time at Camp Cody. After the First World War he became a chiropractor and he died in 1971 at the age of 80. 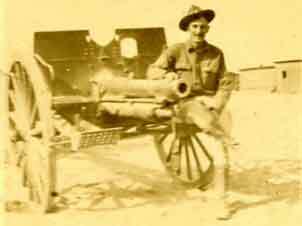 Elmer H. Titus was in Battery “C” – Muscatine, Iowa National Guard who was stationed at Camp Cody. During the US – Mexico Border War Elmer served under General Pershing. After the First World War he became a chiropractor and he died in 1970 at the age of 80. Elmer is the father of Mariana Titus.